January 16th in St. Louis, Eric Nystrom netted his 12th goal of the season, a new career-high for the 28-year-old left winger. But when asked about that tally after the game, he chose not to touch on it, instead discussing how things went wrong for the Stars in a loss to the Blues. As part of Dallas’ third line alongside veterans Vernon Fiddler and Radek Dvorak, the second-generation NHL player has definitely not only found a niche with the Stars, but also with his current line, a trio that brings grit, determination and a tireless work rate to the ice. Nystrom’s previous career high in goals was 11, a mark which he set in 2009-10, a season which proved to be his final year in Calgary. He looks back at his career to date, which has also taken him to Minnesota and realizes that after having some earlier struggles in the NHL, he has finally found a club where he is a great fit. But this is still a player who not all that long ago was toiling with the Wild, a club where after a recent coaching change he didn’t fit into their plans. Last season he skated in all 82 games for Minnesota and finished with 12 points (4-8-12) but when the Stars ended last season with a disappointing loss in the Twin Cities to keep them out of the playoffs which proved to be his final regular-season game with the Wild. That’s because during the off-season, management made a coaching change and after not making the opening night roster, he was sent to Minnesota’s AHL affiliate the Houston Aeros. In short, it was clear he needed a change of scenery. Nystrom got just that when the Stars acquired him in a trade at the start of the 2011-12 regular season, and as they say the rest is history. Still, he can’t help but look back on his time in the Twin Cities and realize that was nothing more than a bump in the road, an experience that helped set the stage for what has been nothing but an immensely positive experience in Dallas thus far. His new head coach knew him back when he was in the Calgary organization, so when the chance to add the New York native to his roster arose earlier this season, he was ecstatic to say the least. He too realizes that the ups and downs that Nystrom experienced during his time with the Wild was a character-building experience that has produced considerable dividends for his third-line winger. 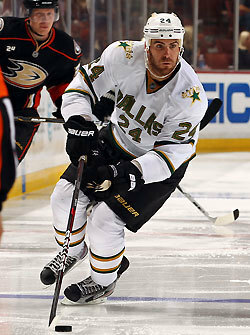 He and fellow Stars newcomer Michael Ryder have combined to give Dallas 29 goals thus far, a big boost for an attack trying to replace the production of All-Star center Brad Richards who is now with the New York Rangers.